I've always found dueling fascinating! As if you couldn't tell from my books. :-) It was such a barbaric practice, yet quite often it was the more refined gentlemen who took part in it. 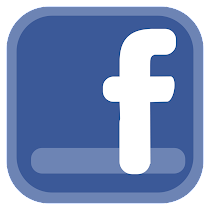 The practice began in the Middle ages, grew in popularity, and spread to America where it survived quite nicely until the late 19th century! In fact, many of America's most important citizens defended their honor by dueling. One of the signers of the Declaration of Independence, Button Gwinnet, was shot down by General Lachlan McIntosh in a duel. Commodore Stephen Decatur of the United States Navy, an experienced duelist, died in a duel with Commodore, James Barron. And Abraham Lincoln narrowly averted a battle with swords by apologizing to an Illinois state official he had ridiculed in a local newspaper. In a typical duel, each man had a friend or acquaintance act as a second. The seconds' main duty was to try to reconcile the parties without violence. The offended party sent a challenge through his second. If the recipient apologized, the matter was over. If, however, he chose to fight, the recipient was allowed to choose the weapons and the time and place of the duel. Up until that determining moment, apologies could be given and the duel stopped. After combat began, it could be stopped at any point after honor had been satisfied. Duels were fought for honor and if a man refused to fight when challenged, he was often shamed in public, his name printed in the newspaper. A refusal could essentially ruin him and his career. Most duelist chose pistols over swords. Flintlock pistols were known for their inaccuracy so choosing them might prolong one's life! By the time of the Civil War, dueling was in decline, mainly due to preachers tirades and public opinion against the barbaric practice. I'm surprised it lasted that long! Dueling was a deadly sport. And like any sport, it had rules. The following rules, called The Code Duello, were created in 1777 by a group of gentlemen-delegates for general adoption throughout Ireland. I thought you might like to browse through them. They are quite interesting and even morbidly amusing. Rule 3. If a doubt exist who gave the first offense, the decision rests with the seconds; if they won't decide, or can't agree, the matter must proceed to two shots, or to a hit, if the challenger require it. Rule 5. As a blow is strictly prohibited under any circumstances among gentlemen, no verbal apology can be received for such an insult. The alternatives, therefore -- the offender handing a cane to the injured party, to be used on his own back, at the same time begging pardon; firing on until one or both are disabled; or exchanging three shots, and then asking pardon without proffer of the cane. N.B. A disarm is considered the same as a disable. The disarmer may (strictly) break his adversary's sword; but if it be the challenger who is disarmed, it is considered as ungenerous to do so. In the case the challenged be disarmed and refuses to ask pardon or atone, he must not be killed, as formerly; but the challenger may lay his own sword on the aggressor's shoulder, then break the aggressor's sword and say, "I spare your life!" The challenged can never revive the quarrel -- the challenger may. Rule 10. Any insult to a lady under a gentleman's care or protection to be considered as, by one degree, a greater offense than if given to the gentleman personally, and to be regulated accordingly. Rule 11. Offenses originating or accruing from the support of ladies' reputations, to be considered as less unjustifiable than any others of the same class, and as admitting of slighter apologies by the aggressor: this to be determined by the circumstances of the case, but always favorable to the lady. Rule 12. In simple, unpremeditated recontres with the smallsword, or couteau de chasse, the rule is -- first draw, first sheath, unless blood is drawn; then both sheath, and proceed to investigation. Rule 13. No dumb shooting or firing in the air is admissible in any case. The challenger ought not to have challenged without receiving offense; and the challenged ought, if he gave offense, to have made an apology before he came on the ground; therefore, children's play must be dishonorable on one side or the other, and is accordingly prohibited. Rule 19. Firing may be regulated -- first by signal; secondly, by word of command; or thirdly, at pleasure -- as may be agreeable to the parties. In the latter case, the parties may fire at their reasonable leisure, but second presents and rests are strictly prohibited. If with swords, side by side, with five paces interval. Well ... as to the 'detailed list' of "Rules for Dueling" ... clearly ('as clear as mud'), methinks AFTER reading the 'rules', the two dueling parties should be scratching their heads and pondering: "Remind me again, WHY are we here, and WHAT were we arguing about ?" Truly, this sounds WAY too complicated ... and I could barely understand half of the rules myself !!! Wow ... so specifically detailed (like a maze of words), and, truly overwhelming ! Trying to even 'understand' this gi-normous listing of rules, one would require intelligence ... which is the irony of it all. For if they were indeed 'intelligent' ... one would think the argument would not have succumbed to 'a duel' in the first place !!! My goodness !!! 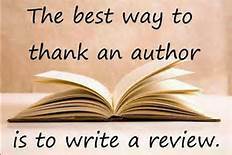 Thanks again for sharing, MaryLu. Very interesting, for sure ! Dueling is so dumb. This is a lot of information that I never knew. Thanks for sharing. A.H. wrote a personal letter that included how he felt about A.B. The letter ended up getting published in a paper, causing A.B. to hate A.H. more than he already did. A duel was set for July 11, 1804. 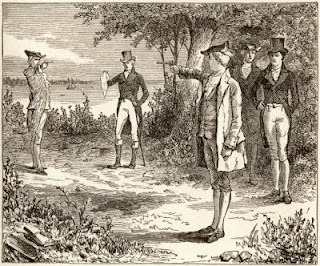 The place of the duel was Weehawkin New Jersey - the same place where A.H.'s son was wounded in a duel. A.H. choose to miss A.B. because he would not take a man's life. So A.B. shot A.H. who then died at two o'clock in afternoon. He was surrounded by his wife and children. Aaron Burr was a grandson of Jonathan Edwards. I love historical fun facts! Thank you for sharing. What I did understand I will tuck away for when I pick up a book where a duel arises. P.S. You mentioned the decline happeing by the Civil War, but wasn't there a time when it was illegal? If it started in the Middle Ages, how popular was it in Europe and how long did it last there? If that's the case with Alexander Hamilton, then he violated rule 13. This is very fascinating. It is a big part of history that we see and over look it. 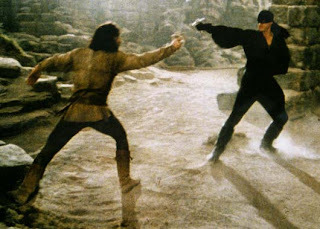 I too love duels and swords fights like this. It is really interesting to see, but often I don't think about what it all involves. Thanks for sharing this piece of history with us, MaryLu. It is fun learning new things. Wow, that's a lot of rules! Thanks for sharing - I've been curious what sorts of rituals and traditions went into it. LOL, I agree, Brenda.. very confusing, indeed. I wonder how many actually read the rules and gave up before they started! Jennie.. Love the football comment! 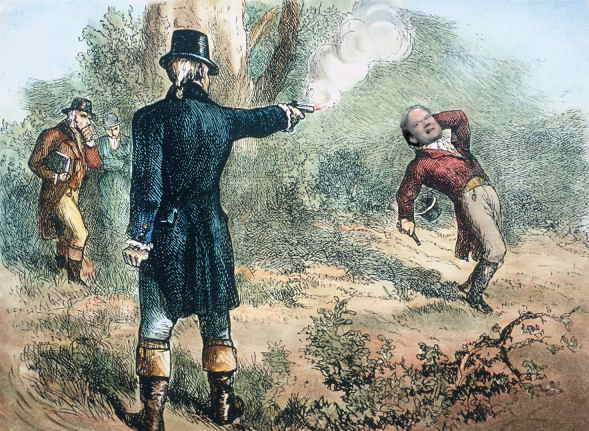 And thanks for the bit of history on the most famous duel in America! Yes, I believe dueling was outlawed in several states prior to the civil war.. just not all of them. And I have n idea how long it lasted in Europe. that's a great question! I'll have to look that up. Shelby. I love sword fights too.. mainly because they are cool to watch.. but these rules make one realize that this was a very serious sport to most men. And deadly! Well said Sapphire.. so many duels were fought by stupid men and their stupid pride. Glad you all enjoyed this.. it was fun doing research on it. Wow, these rules are ridiculous. I can't even understand half of them. Like Brenda said, you would think by the time they actually got to the duel they would be wondering, why in the world are we doing this?! And stop. That last rule cracked me up, though - "Where seconds disagree, and resolve to exchange shots themselves, it must be at the same time and at right angles with their principals." Really? You're going to have a duel over a duel?! dueling was illegal during the time that hamilton and burr had there duel. atleast in the north american states. Burr was charged with murder and fled to his daughters house in the south. The charges against him were eventually dropped and he returned to finish his term as senator or w/e his job was. Its the twenty-five duel commandments!